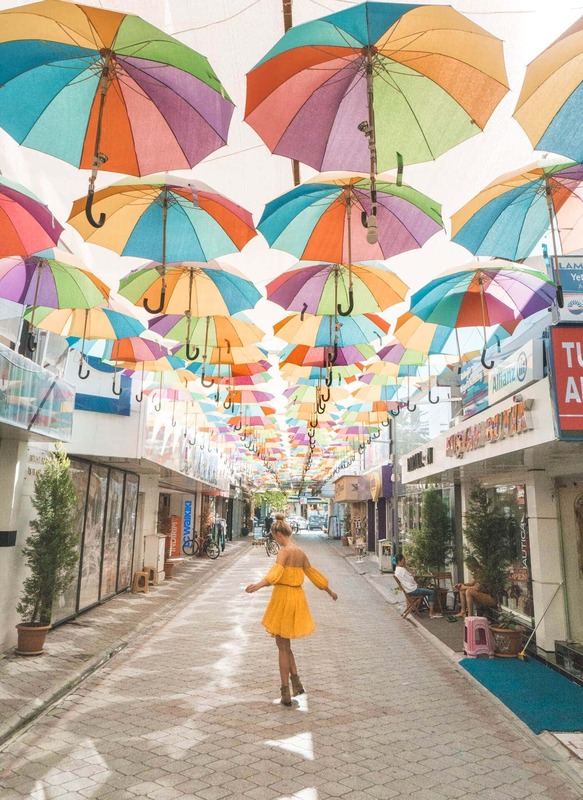 Turkey is a huge country who offers a scenery/environment for every kind of traveler. 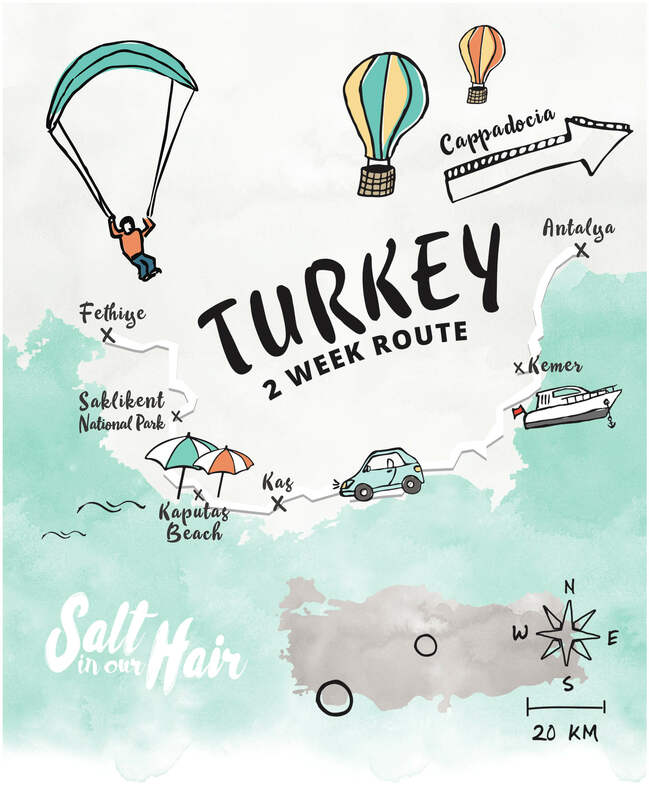 This two-week Turkey Route Guide will take you along a part of the Turquoise Coastline of Turkey and into the mainland to the Hot Air Balloons in Cappadocia. Transportation and destination information are provided with extra options like going with a bus instead of flying from A to B. The roads we’ve had were superb so self-driving through Turkey is highly recommended by us! Start your trip in Antalya. Rent a car at the airport and drive directly to Kas (about 3 hours). If you like to have a break to have lunch or dinner, we recommend you to pick a restaurant at The harbor of Kemer. Kas is a beautiful and small town. It offers beautiful beaches, great food, shopping, and quite some sightseeing. Don’t forget to visit the picturesque Kaputas Beach. 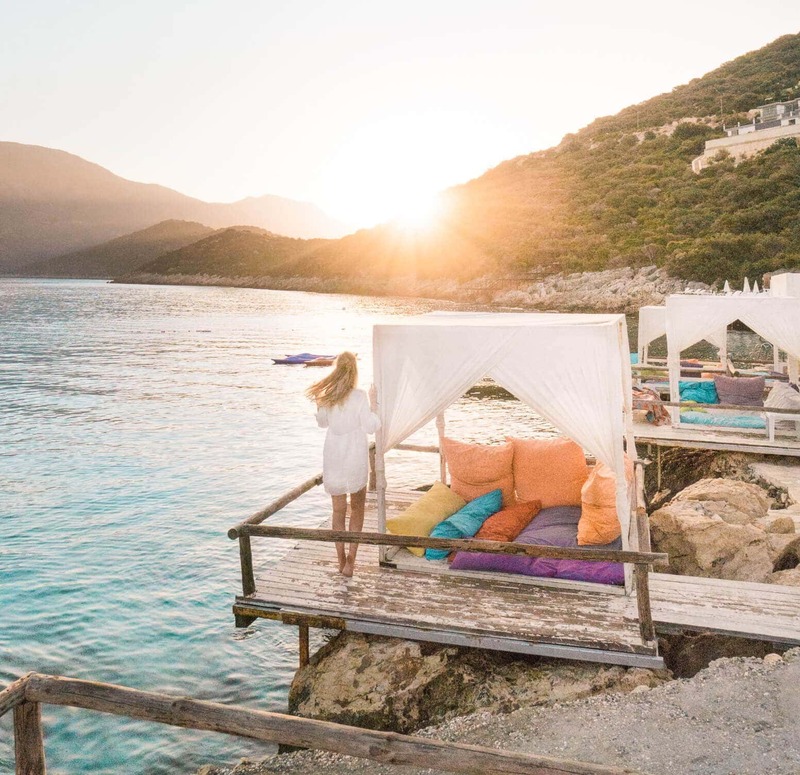 Leave in the morning from Kas and drive to Kalkan for lunch. The drive is about 1,5 hour with some small stops to enjoy the view and cliff drops. 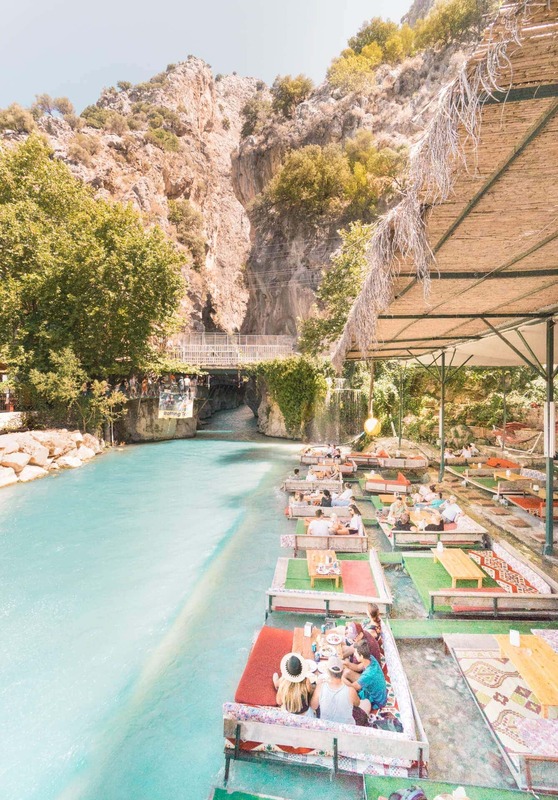 After a great Turkish lunch, head to Saklikent Gorge, which is a 300 meter-high and 18 kilometer-long canyon, one of the deepest in the world. 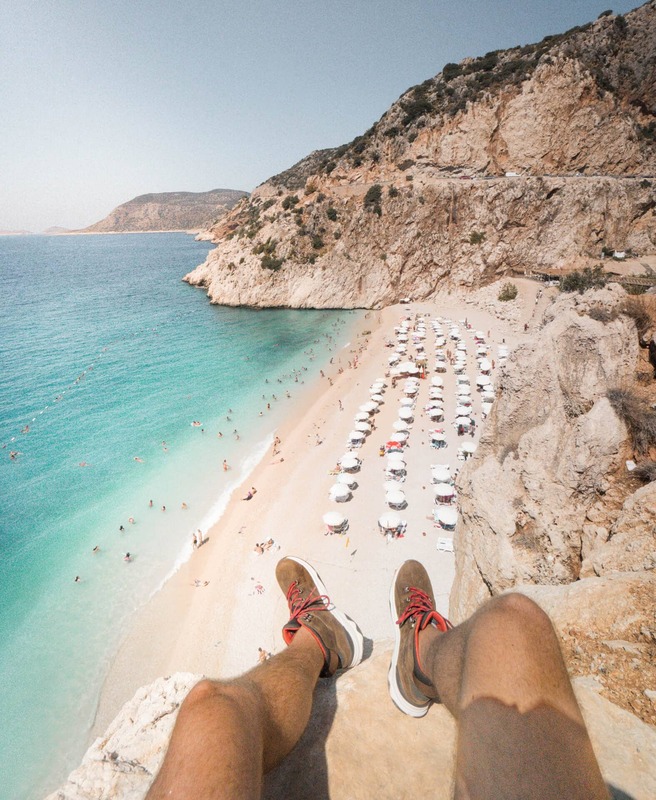 This is about a 45-min drive from Kalkan. 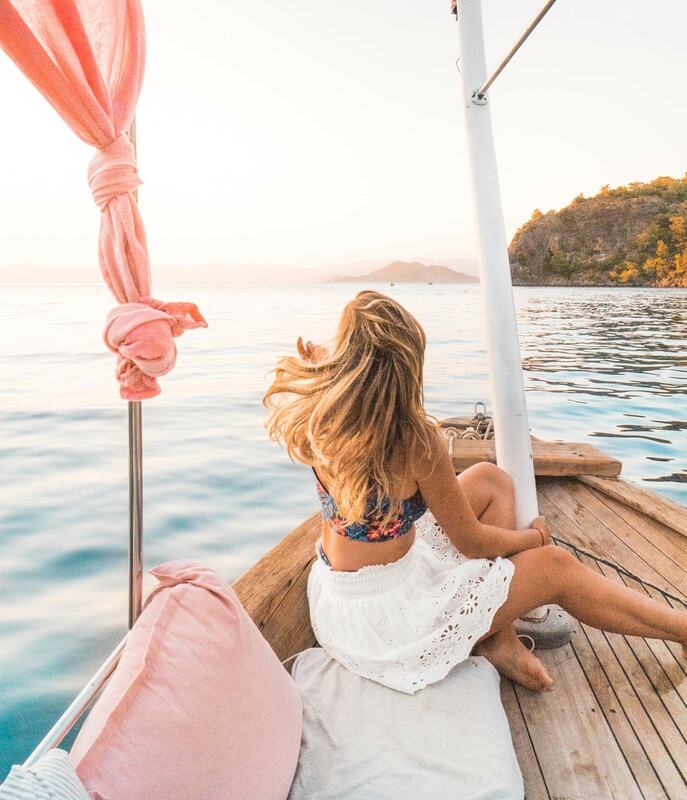 Continue your trip to the final destination, Fethiye. This is a city where you can easily wander around for two days. 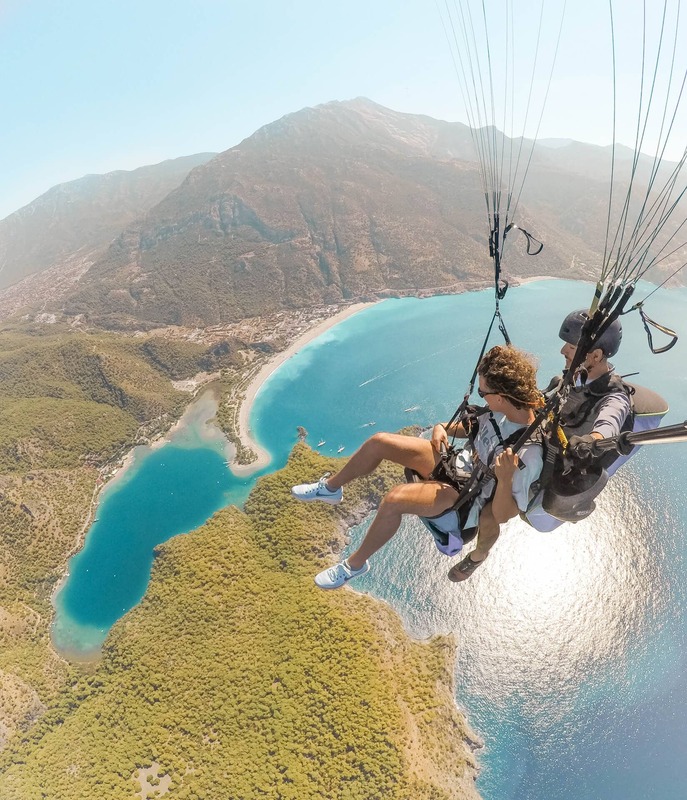 Paragliding is very popular and highly recommended in this area. The view from up there is unreal. Tip: If you have more time you can also add in Pamukkale. These salt baths are a well-known spot so make sure to arrive in the early morning. It can be done in a day trip but it isn’t recommended. 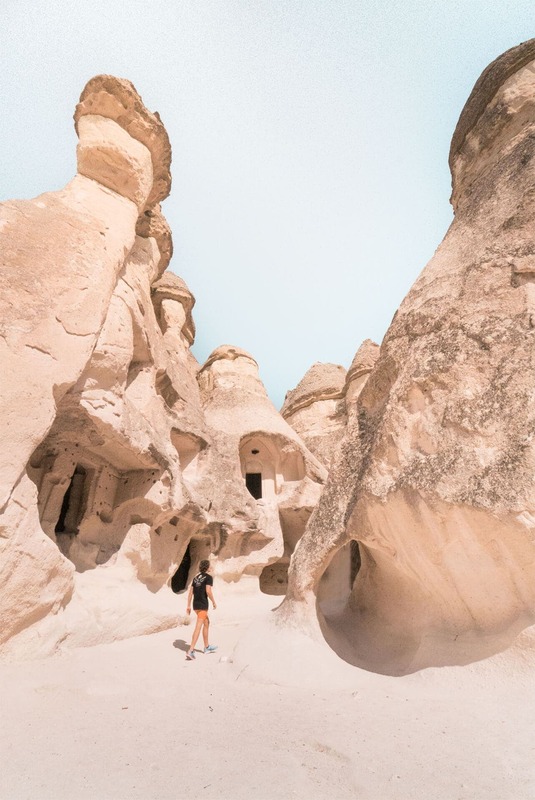 Cappadocia is quite a distance into the country and can be reached in a few ways. 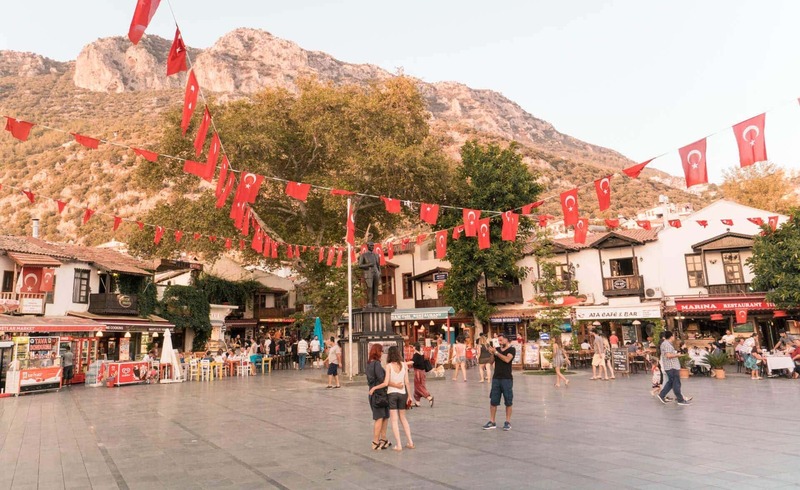 The first option: Drive back to Antalya, return the car and either fly out the same day or take a hotel for the night and fly out the next morning very early. Driving back from Fethiye to Antalya takes about 3 hours. Fly from Antalya to Kayseri. Kayseri is the best airport available to reach Cappadocia because it’s just a 30 minutes drive with a taxi to Goreme (a town in the Cappadocia area). 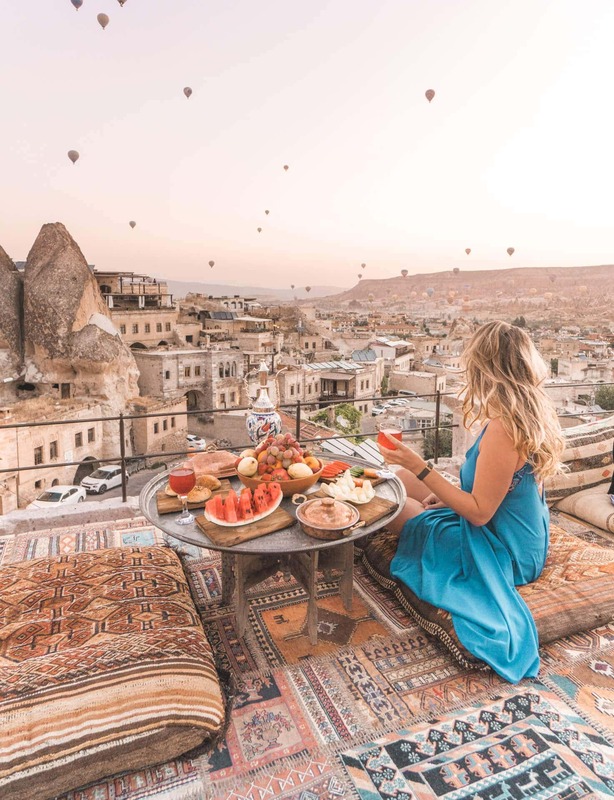 Take at least two nights in Cappadocia. Even when you take four, it won’t be enough. There is so much to do in this area and every new sunrise will be one to remember. The sky will be filled with Hot Air Balloons and maybe you can even fly with one. 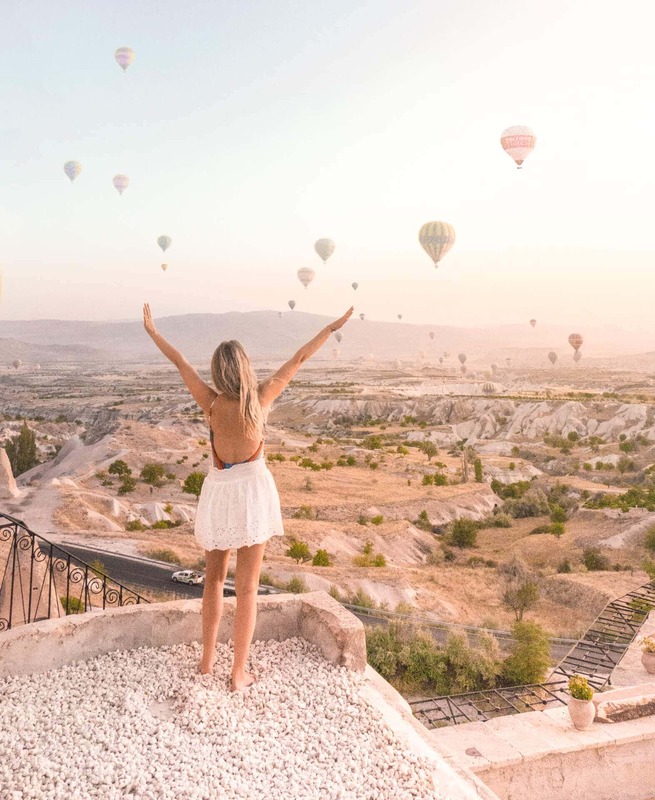 Other than the balloons, you can do a sunset ride on a horseback, stay in one of the many cave hotels, visit Pasabag or the Open Air Museum and many more things. 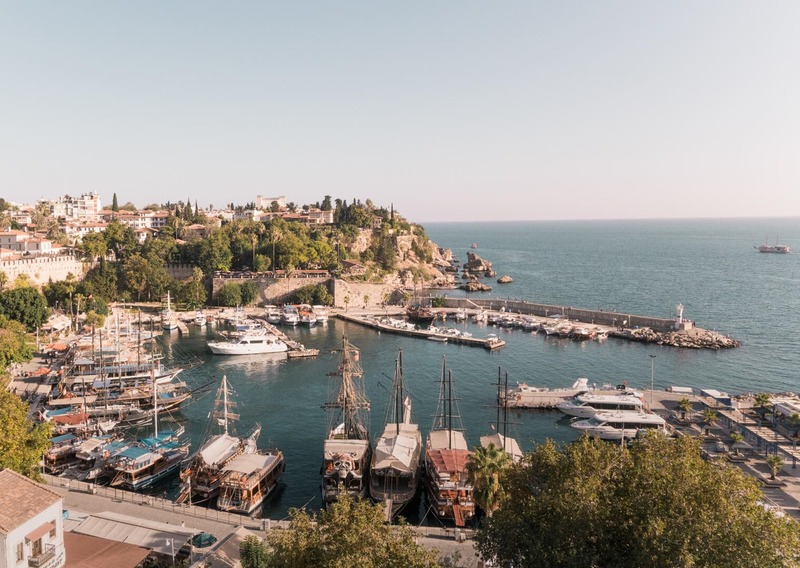 On your last day (or the evening before) fly back to Antalya and make sure to stay in Antalya old town called Kaleici. It is surprisingly quiet and laid-back in the part of a huge city. Our hotel in Kaleici was located perfectly near all the sights in old town. You will need to apply for a visa to Turkey. This is usually done in a day or two and costs about $20 each. Prices are rough estimate what we spend per person.